Imagine you could capture knowledge of every person in your organisation in real-time and make it immediately accessible to your staff or customers via an online natural language portal. This collective knowledge would be self-managing and bring the right information to the ‘top’ of any search. Your knowledge will never be outdated and will be available 24/7. And in the near future, it will underpin AI so advanced that human intervention in operational transactions will be kept to a minimum, while assisted service will become indispensable for more advanced problem-solving. Achieving this would make yours the smartest organisation in the world. 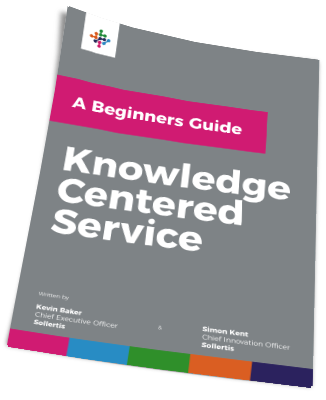 Knowledge Centered Service (KCS®) is proven methodology for improving knowledge management. This guide outlines the main strategies and components of KCS, as well as detail what makes it so unique. Why do we need to rethink knowledge management? Current knowledge management efforts are flawed and labour intensive. We explain why KCS can create a more powerful, self-sustaining knowledge engine to pool collective intelligence. People are essential to any methodology or technical endeavour. See how KCS puts people at the heart of knowledge management to ensure it is accepted, used and long-lasting. Relevant and accurate knowledge is vital for self-service and assisted service. Learn how the next generation of AI ‘bots’ will be built on the robust knowledge management of KCS.